You are viewing an old revision of this post, from November 17, 2010 @ 11:12:02. See below for differences between this version and the current revision. Zuckerberg was referring to a big map on the wall behind him that charted the conference’s theme of “points of control.” Battelle and O’Reilly had aimed to provide a graphic display of all the different entities that shape and limit our experience online today. It’s a useful exercise in many ways. But Zuckerberg argued that it was wrong-headed in describing an essentially closed system. Now, of course it’s in Zuckerberg’s interest to make this argument. And it would be disingenuous to maintain that Facebook isn’t engaged in some real direct competition with the other big Net-industry players today. As Tim Wu’s new book reminds us, the cycle of communications-technology innovation runs in a regular pattern in which innovators become monopolists and monopolists exact their tolls. Facebook, like its predecessors, is likely to proceed accordingly. Nonetheless, I think Zuckerberg’s larger point is profoundly right. He found a way to remind us of something that was true when I started creating websites 15 years ago and that’s still true today: It’s still early in this game, and the game itself continues to grow. The portion of the online realm that we’ve already invented is still a mere fraction of the total job of creation that we’ll collectively perform. There is more world to come than world already made. I find that I regularly need to remind myself of this every time I’m thinking of starting something new. When I started the Salon Blogs program in 2002 I worried that we were late arrivals to that game. 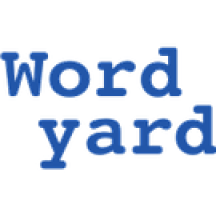 Blogging had been around forever — I’d been reading them for five years! We shouldn’t forget that at the time of Google’s founding in 1998, search was considered old hat, a “solved problem.” Similarly, Facebook itself could have seemed a johnny-come-lately five years ago, coming as it did on the heels of Friendster, Orkut and MySpace. The Net is still young and what we do with it and on it remains an early work in progress. The “uncharted territory” still beckons those who enjoy exploring. And it may be that one secret of Zuckerberg’s and Facebook’s success is that they aren’t losing sight of this truth as they plunge into the technology industry’s crazy scrum. Zuckerberg was referring to a big <a href="http:// radar.oreilly.com/2010/08/ points-of-control-the-web- 20-s.html">map</a> on the wall behind him that charted the conference's theme of "points of control." Battelle and O'Reilly had aimed to provide a graphic display of all the different entities that shape and limit our experience online today. It's a useful exercise in many ways. But Zuckerberg argued that it was wrong-headed in describing an essentially closed system. Zuckerberg was referring to a big <a href="http:// radar.oreilly.com/2010/08/ points-of-control-the-web- 20-s.html">map</a> on the wall behind him that charted the conference's theme of "points of control." Battelle and O'Reilly had aimed to provide a graphic display of all the different entities that shape and limit our experience online today. It's a useful exercise in many ways. But Zuckerberg argued that it was wrong-headed in describing an essentially closed system. ZUCKERBERG: "I like this map that you have up here, but my first instinct was, your map's wrong." ZUCKERBERG: "I like this map that you have up here, but my first instinct was, your map's wrong." BATTELLE: "Of course it's wrong, it's version one."" BATTELLE: "Of course it's wrong, it's version one." 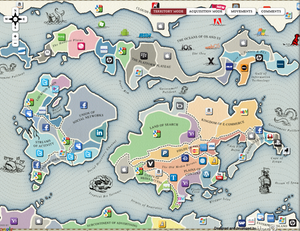 ZUCKERBERG: "I think that the biggest part of the map has got to be the uncharted territory. Right? One of the best things about the technology industry is that it's not zero sum. This thing makes it seem like it's zero sum. Right? In order to take territory you have to be taking territory from someone else. But I think one of the best things is, we're building real value in the world, not just taking value from other companies." 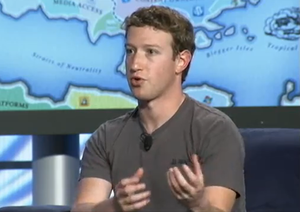 ZUCKERBERG: "I think that the biggest part of the map has got to be the uncharted territory. Right? One of the best things about the technology industry is that it's not zero sum. This thing makes it seem like it's zero sum. Right? In order to take territory you have to be taking territory from someone else. But I think one of the best things is, we're building real value in the world, not just taking value from other companies." Now, of course it's in Zuckerberg's interest to make this argument. And it would be disingenuous to maintain that Facebook <i>isn't</i> engaged in some real direct competition with the other big Net-industry players today. As <a href="http:// online.wsj.com/ article/SB10001424052748704635704575604993311538482.html">Tim Wu's new book reminds us</a>, the cycle of communications-technology innovation runs in a regular pattern in which innovators become monopolists and monopolists exact their tolls. Facebook, like its predecessors, is likely to proceed accordingly. Now, of course it's in Zuckerberg's interest to make this argument. And it would be disingenuous to maintain that Facebook <i>isn't</i> engaged in some real direct competition with the other big Net-industry players today. As <a href="http:// online.wsj.com/ article/SB10001424052748704635704575604993311538482.html">Tim Wu's new book reminds us</a>, the cycle of communications-technology innovation runs in a regular pattern in which innovators become monopolists and monopolists exact their tolls. Facebook, like its predecessors, is likely to proceed accordingly. Nonetheless, I think Zuckerberg's larger point is profoundly right. He found a way to remind us of something that was true when I started creating websites 15 years ago and that's still true today: It's still early in this game, and the game itself continues to grow. The portion of the online realm that we've already invented is still a mere fraction of the total job of creation that we'll collectively perform. There is more world to come than world already made. Nonetheless, I think Zuckerberg's larger point is profoundly right. He found a way to remind us of something that was true when I started creating websites 15 years ago and that's still true today: It's still early in this game, and the game itself continues to grow. The portion of the online realm that we've already invented is still a mere fraction of the total job of creation that we'll collectively perform. There is more world to come than world already made. I find that I regularly need to remind myself of this every time I'm thinking of starting something new. When I started the Salon Blogs program in 2002 I worried that we were late arrivals to that game. Blogging had been around forever -- I'd been reading them for five years! We shouldn't forget that at the time of Google's founding in 1998, search was considered old hat, a "solved problem." Similarly, Facebook itself could have seemed a johnny-come-lately five years ago, coming as it did on the heels of Friendster, Orkut and MySpace. I find that I regularly need to remind myself of this every time I'm thinking of starting something new. When I started the Salon Blogs program in 2002 I worried that we were late arrivals to that game. Blogs had been around forever -- I'd been reading them for five years! We shouldn't forget that <a href="http:// www.salon.com/ 21st/rose/1998/ 12/21straight.html">at the time of Google's founding in 1998</a>, search was considered old hat, a "solved problem." Similarly, Facebook itself could have seemed a johnny-come-lately five years ago, coming as it did on the heels of Friendster, Orkut and MySpace. The Net is still young and what we do with it and on it remains an early work in progress. The "uncharted territory" still beckons those who enjoy exploring. And it may be that one secret of Zuckerberg's and Facebook's success is that they aren't losing sight of this truth as they plunge into the technology industry's crazy scrum. The Net is still young and what we do with it and on it remains an early work in progress. The "uncharted territory" still beckons those who enjoy exploring. And it may be that one secret of Zuckerberg's and Facebook's success is that they aren't losing sight of this truth as they plunge into the technology industry's crazy scrum. Yes, Email is too slow, because you want to get the tasks get done at the top priority moment, because if you shuffle it to later, maybe you never remember that task again, but maybe it was the really important one.